I have the same problem too .. It worked properly only for two days from 24th - 26th of November an after that no possible connection between airdroid and my mobile phone!!!! 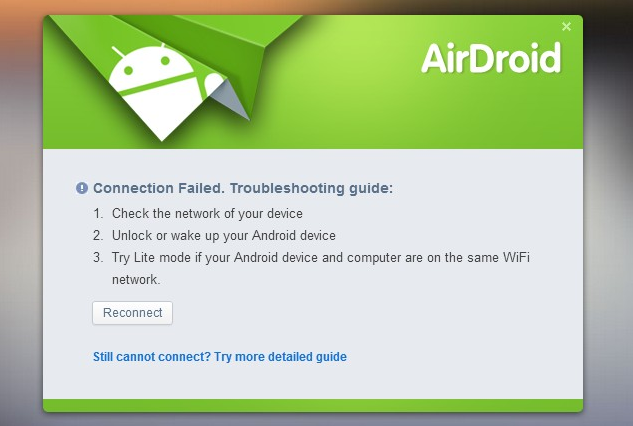 If it fails again and you are sure the device and the computer are connected to the same network, you may try AirDroid Web Lite to connect by visit the IP address shown in AirDroid on your device. ​- If you don't know why, we have a diagnose team to do it for you, check it out here. - If you do know the reason, follow the link(s) below, you can find the settings according to your need. 1. If you have connected your device to 2G/3G/4G network, the network will be disconnected when you receive an inbond-call. Thus the connection between your device and PC/laptop will be interrupted. You may connect your device to WiFi network and try again. 2. If you're using AirDroid Win/Mac, the connection will be interrupted when the computer goes sleep. AirDroid will restore the connection automatically when the computer connects to network again. I updated the app on my android phone and laptop. Tried to send some files from my laptop to phone using desktop app via local connection, but failed all the time. It somehow works on AirDroid Web. Sending files from my phone to desktop app works perfectly fine too. Tried connection diagnostic tools and everything works well. Any suggestions? o que aconteceu com o site??? Can you send us some screenshots? Here was helpful to restart the Android-Device. airdroid is up and running on my pc. I have gone to the PlayStore and installed the Airdroid app on my android galaxy note 4, but see no way to connect the smartphone to the desktop pc. If the client is not updated can I still connect thru web.airdroid.com?